The easiest way to start populating your pin board is to use the Pinterest’s built-in search tool to find pins that interest you and then pin them to your own board. The search bar on top allows you to search anything in Pinterest’s database. By clicking on the three horizontal bars in the search bar, you can filter your search results by category. When you see a pin you like, just click the “Save” button, this will then prompt you either select an existing board or create a new board to pin your resource to. Search for pins using the built-in search tool. 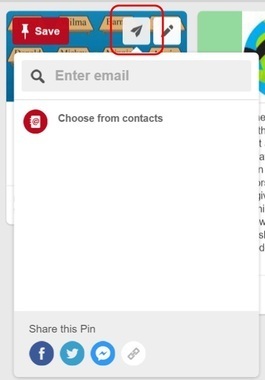 Filter pins using the drop down menu. As well as pinning other people’s pins, you can also create your own pins and boards. To create a new board on your account, click on your profile (upper right hand corner) and click on the "Create a board +" tile. Give your board a name and a brief description (This will help potential followers discover your board). Select an appropriate category (e.g. Education). Once you’ve created your board, you can either search for existing pins to add to your board or add your own. To add your own pins, click on the ‘Add +’ tile and choose either ‘Pin from the web’ or ‘Pin from your device’. Anyone following you or your board will be notified of any updates in their news feed. Pinterest also allows you to share your pinboards through social media channels such as Facebook and Twitter or by creating a link. To share a board, simply click on the share icon at the top of your board. Share your boards via other popular social media such as Twitter & Facebook. Categorise your boards – Tagging your pins with education related keywords will help other educators find your pins more easily. Popular edu keywords: education, teacher, classroom. Be social – Using your other social media profiles to share your pins will not only help other people find your boards but also help build your Personal Learning Network (PLN). 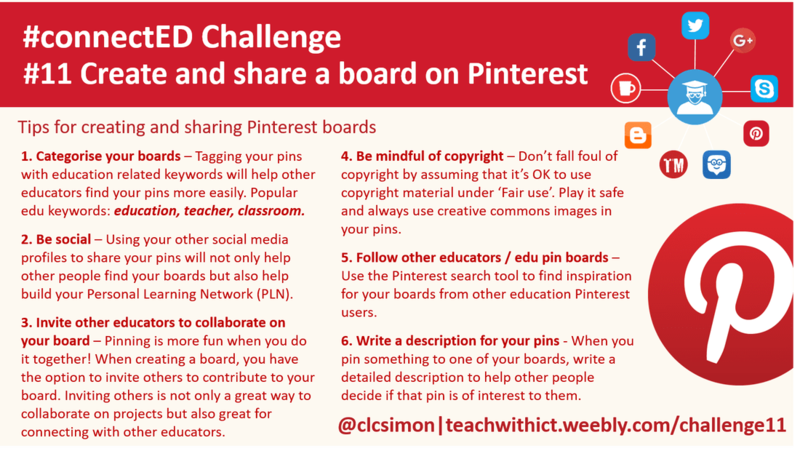 Invite other educators to collaborate on your board – Pinning is more fun when you do it together! When creating a board, you have the option to invite others to contribute to your board. Inviting others is not only a great way to collaborate on projects but also great for connecting with other educators. Be mindful of copyright – Don’t fall foul of copyright by assuming that it’s OK to use copyright material under ‘Fair use’. Play it safe and always use creative commons images in your pins. Follow other educators / edu pin boards – Use the Pinterest search tool to find inspiration for your boards from other education Pinterest users. http://www.educatorstechnology.com/2012/11/10-pinterest-boards-every-teacher-must.html – 10 Pinterest boards every teacher should follow.